I wake up between 5 or 6 am every morning (depending on what was undone when I went to sleep) and study and then get ready for the day as quickly as I can. Grab my bread, cheese, and warm milk (coffee if lucky!) from the cafeteria and head to class. If I find myself with enough time I will sit down and read an article or two out of the most recent edition of the Economist or a Cuban newspaper. The Orbe and the Juventud Rebelde have local and some international news and are about 8 pages each. No classifieds. Then it is off to class. Got to be there by 8am with correct uniform (white bata and blue pants, they say black shoes but no one really enforces that). From 8 to about noon is class. Class interactive and small (9 students) so lunch time sneaks up quickly. Back to the cafeteria, hoping there is no line for my comedor (comedor 6). Usually there is not now that they rearranged which groups are eating in which comedor. Cuba is really good at handling large groups of people for anything (feeding, injecting, screening, teaching ect). Lunch could be a big piece of pork with plenty of fat; a couple of hot dogs, chicken, and, of course, the staples of rice and beans. Ice cream is usually served twice a week. Pretty much everyone cleans their plate, but if its pork day I try to search out my Muslim friends from Palestine and Guinea, as that means a lot more meat for me. Then right back to class until around 4:30. These classes have more students, around 25. We are all in groups (I’m in group 27) and we have all of our classes with the same group. In my group are Brazilians, bunch of folks from the Solomon Islands, and a couple each from Tuvalu, Kiribati and Guyana. Since about two years ago the Latin American School of Medicine has really become a global school with representation from around 40 or 50 countries. After class I find an empty room (under a fan) and study until dinner. If I feel like braving the mob I can go stand in line for internet. Our school has a daily quota of internet use (something like 1024 MB) and it usually runs out around 5:30pm. This is why our weekly guaranteed internet time starts at midnight, when the daily quota rolls over. After studying or internet it’s back to the cafeteria for dinner. I usually get done with dinner around 6 or 6:30 depending on who I sit with and how good the conversation is. Usually I sit with a group of friends from Mexico or just with people I have not met yet and strike up a conversation. I always have the goal of getting right back to my room and getting to work, but I usually end up falling asleep while waiting for our water to turn on so I can get a shower (we get water three times a day in our dorm, morning, noon, and night, for an hour each time). So I usually end up cracking the books and opening the laptop around 7:30 or 8…sometimes 9 if I get distracted by one of the 10 people I share a room with. I sit in my bed, open the shutters, and enjoy the caribbean breeze. We have a snack (break and cheese with yogurt or juice) served from 9pm to 11pm and that is another trip to the comedor. I always tell myself to sleep by 10pm but that never happens. Midnight is the norm. Sometimes roommates are loud and wake me up, but not often. Usually just too exhausted to be bothered and everyone respects each other more or less in room. That is a very brief rundown of my Mondays-Fridays at ELAM. 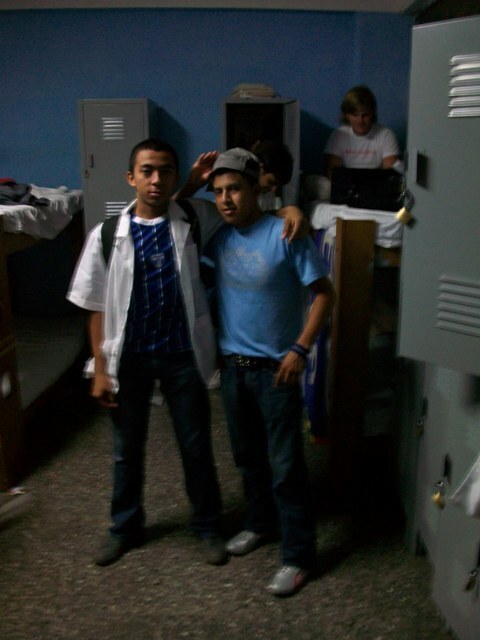 This entry was posted in Life at ELAM and tagged cuba news, ELAM, food. Bookmark the permalink. I want to see a picture of some of these meals that you are eating in between these classes and your massive study sessions! Good thinking searching out your Muslim friends, more forbidden food for you! Sounds like just the kind of days you dream of doing. I know you love productivity. I’m only disappointed so far about the internet situation, but I can tell you’ve made due so far by continuing with your post on your blog. Sounds like a good routine mi amigo. Is med school as hard as they say it is? When can you prescribe surf and R&R for my ADD? What is the local buzz on the oil leak and the Gaza flotilla crisis? We miss you like mad, but I am sure you dont miss the opressive heat, traffic jams, and high cost of living. The surf is flat but the fishing is okay. August-like heat here in June, but JB is great. Well be safe and remember to share your chicken with our Muslim brothers and sisters!